The bus stops for the millionth time and I look down at my phone for the millionth time. A little envelope appears in the corner of the screen., I click on it. It's from my sister, Zahra. What you gonna wear to the party? Sat on the top of a bus days before Christmas, Maya sees a couple arguing violently in the middle of a crowded Regent Street. They see her watching, she looks away, and the woman disappears. Maya goes to the police, who shrug and send her away. Then a body turns up… Now convinced she is a vital witness to a crime, the police send Maya into hiding in rural Wales. She resolves to get to the bottom of the mystery. Then the snow comes and no one can get out. But what if someone can still get in? This is a perfect book for the season. Bring on the snow! 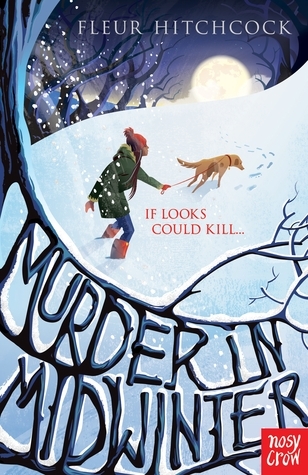 Fleur Hitchcock has made me desperate for it, with this wintery, murder mystery. The book is aimed at the Middle Grade market, but it had an older feel to it. I would suggest that it would easily suit the younger YA crowd as well as Middle Grade. Maya is a fantastic main character. I think she is from mixed heritage, but it isn't really mentioned and I'm only guessing because of the names of the family members and the unusual white streak in her hair. She is courageous and bold, with a fantastic hobby. Maya likes to assemble and disassemble motor bikes. What an excellent role model she is. She has a strong bond with her sister and will do anything to protect her. I was thrown straight into the story from the first chapter and found myself quickly turning the page to find out what happened next. The plot takes us from the bustling streets of London to the silent and lonely valleys of Wales. Maya doesn't really feel any safer there and can't wait to get back home. It doesn't help that her cousin, Ollie is so horrible to her. The plot keeps us on our toes through out the book and leaves you with an unexpected ending. Some of the final scenes had me gripping the edge of the seat. Especially all the scenes involving the horses. Any animal scene is guaranteed to break my heart. For those who love a fast paced, thrillingly tense Middle Grade read, this is the book for you. Definitely one for the Christmas stocking.